Louise Bogan was born in Livermore Falls, Maine. 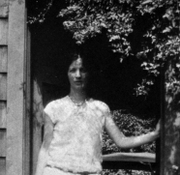 During her childhood, the family moved throughout Maine, New Hampshire, and Massachusetts, where her father worked for paper mills and bottling factories. She was able to attend the Girls’ Latin School in Boston, which led to the opportunity to attend Boston University. In 1916, she dropped out of college after her freshman year and gave up a scholarship to Radcliffe to marry Curt Alexander, a soldier in the U.S. Army. The couple had a daughter but the marriage ended in 1918. Louise moved to New York to pursue a career in writing. She became friends with other writers such as Margaret Mead, Malcolm Cowley, Léonie Adams, William Carlos Williams, Conrad Aiken, and Edmund Wilson. Her first book of poetry, Body of This Death: Poems, was published in 1923. That year she met Raymond Holden, a poet and novelist, whom she married in 1925; they divorced in 1937. Her second book of poetry, Dark Summer: Poems, appeared in 1929. She was hired as the poetry critic for The New Yorker, where she remained for nearly 40 years. She also translated works by Jünger, Goethe, and Renard. In 1945, she was appointed the fourth Poet Laureate to the Library of Congress. A volume of her collected works, The Blue Estuaries: Poems 1923-1968, was published shortly before her death. Her autobiography, Journey Around My Room, appeared in 1980. Louise Bogan is currently considered a "single author." If one or more works are by a distinct, homonymous authors, go ahead and split the author. Louise Bogan is composed of 2 names. You can examine and separate out names.